Receive your screening package from POV. 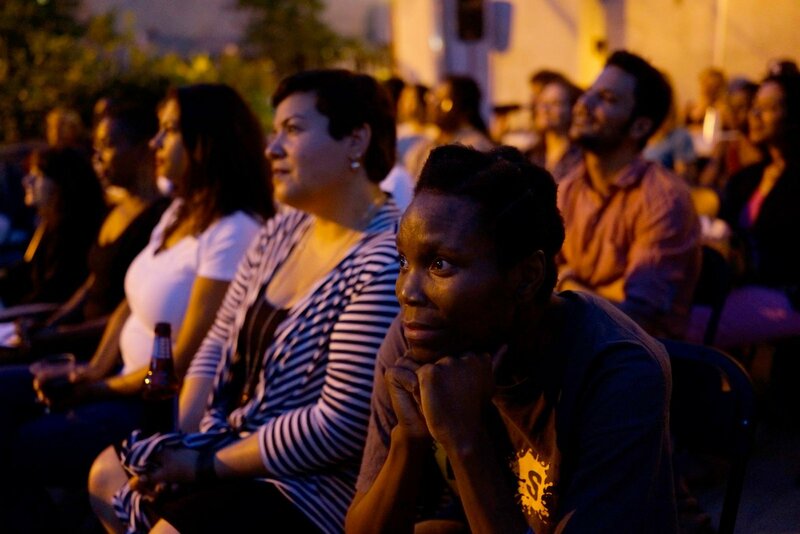 If you have not received the film you requested one week prior to your event, notify us at events@pov.org. We strongly advise you to preview the film when you receive it to ensure there are no issues. On the day of the event, test the film on the equipment you will be using to show the film to ensure that it plays smoothly. If you have any problems with the copy of the film you are sent, email us at events@pov.org and we will work with you to resolve the issue. Collecting audience feedback is an important part of the work we do and helps us gauge the community’s needs. All personal information is strictly confidential, and we will quote audience members only if they authorize us to do so. If you need more copies of the audience evaluation than are included, feel free to make photocopies. Choose a facilitator, moderator and/or speakers. It is best to choose people who are familiar with the issues and can create a friendly environment for meaningful dialogue about the issues raised by the film. If you need to find someone else to facilitate, university professors, human resource professionals, clergy and youth leaders may be specially trained in facilitation. In addition to these local resources, groups such as the National Conference for Community and Justice, Intergroup Resources and Essential Partnersmay be able to provide or help you locate skilled facilitators. If you need to find someone else to moderate, consider a local journalist, for example someone from The Alliance of Women Film Journalists. To help your facilitators or moderators, we have free discussion guides available on the POV Community Network. Look for a link to the film’s Community Network listing in the email you will receive after registering your screening. Email or send your facilitators the Tips for Facilitators below. You can design your own event flyer, or use a template provided by POV. All templates can be found in the films’ partner toolkits. If you design your own flyer, please send it to events@pov.org for approval before distributing. — If you plan to contact media outlets for publicity for a sneak-preview screening of a film that has not yet broadcast on PBS, please send us a completed Media Contact Form (below) and your press release. — Our communications department will review and approve your contacts to ensure there is no overlap between our outreach efforts and yours. Ask reporters to attend your event or review the film (send reporters to our online pressroom: amdoc.org/pressroom). Pitch the value of this unique screening and the importance of encouraging dialogue around contemporary social issues. If reporters cannot attend and would like to obtain copies of the program for review, they should contact POV’s communications department at communications@pov.org or (212) 989-7425. If local broadcast information (day and time) is available, encourage reporters to include it in their stories so others can tune into the program. We encourage our screening partners to connect with their local PBS stations around promotional efforts. Please email events@pov.org so we can put you in touch with the appropriate contact. Look into what social media platforms are being used by your target audience (Twitter, Facebook, Instagram) and engage with them before and after your event. If you are hosting a screening of a current season film, please submit a media contact form to POV before you alert local print, radio and television outlets about your local event. Email your list to communications@pov.org and we will respond within 48 hours. This is to ensure that we do not duplicate promotional efforts. How will POV promote your event? When you input your screening information into the Community Network, your event will appear on our local events map, which can be accessed on the POV website (communitynetwork.amdoc.org/events). We will use our various social media platforms to promote your screening. Be sure to follow us on Twitter @POVdocs and like us on Facebook so we can share promotional efforts.